If you were arrested for a Marietta GA DUI, your case may be heard in Marietta Municipal Court. The City of Marietta Municipal Court location is 240 Lemon St NE, Marietta, GA 30060.The Marietta police headquarters is housed in the majority of this Marietta Court building. The Marietta Municipal Court phone number is (770) 794-5400. One of our veteran Cobb County DUI lawyers will gladly appear with you in Municipal Court of Marietta, and for most court dates we can attend in your place. You do not have to appear in person. This is especially true with your first court date, called a DUI arraignment, unless your criminal attorney tells you to be there after your DUI arrest. At this first appearance before a Marietta judge, you or your criminal attorney are required to enter a plea of guilty, not guilty, or no contest (nolo contendere). The choice is always yours, but if you plead guilty as charged you will immediately face very stiff Georgia DUI penalties, including possible jail time, driver’s license loss, community service, DUI class, and court fines. Remember that a DUI conviction is forever, since Georgia DUI laws have no expungement law for DUI. Chief Judge Roger J. Rozen is the head of this court. Judge Rozen previously served as Solicitor (Prosecutor) for the Municipal Court from 1982 until his appointment as Chief Judge in 1983. The Marietta Municipal Court prosecutor is Robert Donovan, who was appointed Prosecutor in 1986. In GA, a misdemeanor prosecutor is called a “solicitor.” In addition to Mr. Donovan, five part-time Assistant Prosecutors are available to assist the prosecutor on DUI cases or other misdemeanor traffic citations, including speeding. The assistant solicitors will fill in for Mr. Donovan when he has a conflict. Mr. Donovan and his team will investigate your DUI charges, conduct a criminal records check, research your alcohol level breath test or blood test results, interview witnesses, recommend a negotiated plea “offer” to your Marietta DUI attorney, and recommend fine amounts for the Judge’s consideration. Our veteran attorneys will file many motions on your behalf. One common type is Motion for Discovery, when your attorney requests copies of all evidentiary material contained in the government’s file. Another motion requesting Plea in Abstentia, is a legal request by your attorney to coordinate with the prosecutor a plea to the charges, for which you do not have to be at court. Serious traffic offenses, like DUI are generally not handled as a plea in absentia. This type of motion is filed if you have moved out of the area, or you live out of state and were just visiting Georgia for business or pleasure. The Marietta Municipal Court has the right and power to conduct non-jury trials only. The only two courts that conduct jury trials in GA are State Courts and Superior Courts. If your case proceeds to a jury trial, your case will be moved to Cobb County State Court, on any DUI misdemeanor or other traffic offense. Any felony charge goes to the Cobb County Superior Court. The long-term consequences of a DUI conviction may not dawn on you at first, but down the road you may face termination from your current job, the possible installation of an ignition interlock device on your car, much higher car insurance rates, reduced new employment opportunities, and broadcast of your mugshot for a Marietta DUI conviction across the Internet. Right now you may feel that all is lost, that the police evidence is just too damaging, and that your DUI police video captured your miserable performance on field sobriety tests. But this is only due to the stress and the unfamiliar territory of going to the Marietta Court. Our top DUI lawyers in Marietta, GA know many ways to avoid a DUI conviction. Don’t panic, and please talk to one of our tenacious Georgia DUI attorneys about our proven ability and willingness to fight for your freedom at every turn. We build a very strong defense in your pending criminal case, and we start fighting for you from the moment you hire us. Countless ways exist to get incriminating breath alcohol test results excluded, and to possibly exclude embarrassing field sobriety test performances. A DUI arrest is in no way a conviction. We prove this every day in Marietta Municipal Court, in other courts in Cobb County, and across metro Atlanta courts. 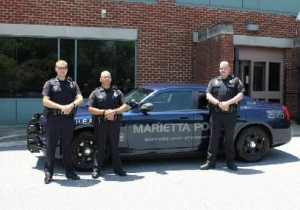 The City of Marietta Municipal Court has jurisdiction over possession of marijuana (less than one ounce) cases and misdemeanor traffic offenses including drunk driving. The Marietta Court conducts non-jury trials, receives guilty pleas, and imposes sentencing. If your drunk driving arrest occurred outside the Marietta city limits, and you were pulled over by a Cobb County police officer or the Georgia State Patrol, your case will be heard in Cobb County State Court. It is located on the Marietta Square about 500 yards from Marietta Municipal Court. The State Court of Cobb County also hears cases involving Smyrna DUI. Each of these other municipal courts operates with the same limited, misdemeanor jurisdiction: Acworth DUI, Austell DUI, Kennesaw DUI, Powder Springs DUI, and Mableton DUI charges. Felony DUI cases, for example in cases that involve injuries or death, DUI 4th offenses, or DUI accidents, are also heard in Cobb County State Court. Your Cobb County DUI lawyer should have years of solid defense experience with your municipal court, and can successfully represent you in any of these city courts located in Cobb County, GA. The court location of your DUI case will be typed onto your traffic citations paperwork that you received upon your release from the Cobb County Adult Detention Center. The date and time of your first court appearance will be printed on the citation. You or your attorney must be present at this arraignment, and different courts have different rules about your attendance. Our Georgia DUI attorneys handle hundreds of cases in Marietta,GA each year. We handle all types of traffic offenses, including hit and run, reckless driving, vehicular homicide, an open container of alcohol offense, DUI child endangerment, felony DUI, marijuana possession, underage possession of alcohol, and speeding. We have successfully represented repeat offenders, multiple offenders, probation violations, incarcerated clients, and underage drivers. No case is too difficult for our firm to take on, whether felony or misdemeanor. Our criminal defense attorneys bring 140 years of collective criminal law experience to the table. Do not be intimidated by tough, well-trained prosecutors, imposing judges, and veteran Marietta police officers. The judicial system can be bewildering and stressful, and many strict court rules exist. The most important rule is DO NOT show up LATE for court, or not show up at all if you are required to appear! Plus, never come to court smelling of alcohol, or with drugs in your system. Being late can lead to a warrant being issued for your arrest, and this can hurt your lawyer’s chances of winning a favorable outcome in your case. Plus, the judge can issue a bench warrant for your arrest for failure to appear (FTA). This can also result in a driver’s license suspension for your non-appearance. Obey all court rules, including no cell phone usage while in the courtroom. Prepare to spend an entire day in court, sitting quietly as other people’s cases are called before the judge. Take notes, hear what is being said, and watch how the private lawyers and prosecutors interact. Write down questions and ask your drunk driving attorney to clarify your questions. It is your criminal record and your driver’s license that is at stake, so talk openly to your DUI lawyer. As with all municipal courts in Georgia, if you do not get an acceptable plea offer (it is your choice), then you can ask your DUI attorney in Marietta GA to request a jury trial. This causes a “bindover” to the State Court of Cobb County, GA. Then, when the case is scheduled for a new arraignment date, your Georgia DUI attorney can start with a new prosecutor, a new judge, and file new motions, to seek to win your case. So, Marietta Municipal Court offers an opportunity to resolve your criminal case, and do it quickly.